President Muhammadu Buhari on Monday said it would neither be prudent nor serve the interests of sound judgment for him to have formed his cabinet immediately he was inaugurated on May 29. He said it was necessary for the country to first put new rules of conduct and good governance in place before he could make critical appointments into his government. Buhari made the clarification in his article titled, ‘Nigeria committed to good governance and fighting terror’, published by the Washington Post ahead of his historic meeting with President Barack Obama of United States. He said it was noteworthy that Obama himself did not have his full cabinet in place for several months after first taking office. He said despite that delay, the US did not cease to function in the interim. He said, “As I meet with President Obama today, the first time a President of the United States will encounter a Nigerian counterpart following the peaceful transfer of power in a contested election in our history, I will be discussing my plans for critical reforms. “So, too, will I discuss why the formation of my administration is taking time and, crucially, why it must. Already there are voices saying these changes are taking too long, even though only six weeks have passed since my inauguration. I hear such calls, but this task cannot and should not be rushed. “When cabinet ministers are appointed in September, it will be some months after I took the oath of office. It is worth noting that Obama himself did not have his full cabinet in place for several months after first taking office; the United States did not cease to function in the interim. “In Nigeria’s case, it would neither be prudent nor serve the interests of sound government to have made these appointments immediately on my elevation to the Presidency; instead, Nigeria must first put new rules of conduct and good governance in place. Buhari said there were too few examples in the history of Nigeria since independence where it could be said that good management and governance were instituted at national level. He said the lack of a governance framework had allowed many of those in charge, devoid of any real checks and balances, to plunder. The President said the fact that he now seeks Obama’s assistance in locating and returning $150bn stolen in the past decade and held in foreign bank accounts on behalf of former corrupt officials was a testament to how badly Nigeria had been run. This way of conducting the nation’s affairs, he said, could not continue. He also argued that failure of governance had been as much a factor in Nigeria’s inability thus far to defeat Boko Haram as had been issues with the military campaign itself. 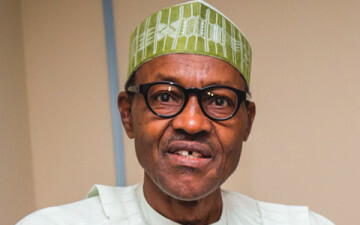 Buhari states, “So the path we must take is simple, even if it is not easy: First, instill rules and good governance; second, install officials who are experienced and capable of managing state agencies and ministries; and third, seek to recover funds stolen under previous regimes so that this money can be invested in Nigeria for the benefit of all of our citizens. “We seek the support and partnership of the United States in these tasks. The importance of the fight against terrorism and corruption in Nigeria, Africa’s most powerful economy and largest populace, cannot be underestimated. “Our allies can provide much-needed military training and intelligence as our soldiers take the war effort to Boko Haram. Similarly, we look to US businesses as well as the Obama administration to help develop governance initiatives that can ensure that Nigeria’s wealth benefits all its people, not just a few. Buhari said since he was elected on a platform of change, he was aware that Nigerians desired change more than anything else. He said he knew that Nigerians were impatient (for action), the same way he realised that the world waits to see evidence that his administration would be different from all those that came before. He however admitted that reforming the country after many years of abuse could not be achieved overnight. “In our campaigns against both Boko Haram and corruption, we should remain steadfast and remember, as it is said: ‘Have patience. All things become difficult before they become easy,” he added. Buhari said this month, the world moved a step closer to the defeat of Boko Haram that had terrorised hundreds of thousands in the northern states of Nigeria. He recalled that in one of his first acts since his inauguration, he had replaced the nation’s service chiefs. He said the new service chiefs had not been chosen because of their familiarity with those in government, as was too often the case in the past, but on their track records and qualifications alone. These new military leaders, the President added, would be based in Borno State, where the headquarters of the armed services had been relocated. He said the shift of resources and command directly to the front line, in addition to the replacement of the head of the State Security Services, and a new emphasis on working in partnership with Nigeria’s neighbours, had equipped his government to take the fight directly to Boko Haram. He said the nation had started seeing a degrading of Boko Haram’s capabilities as a fighting force. He said, “In recent weeks, it appears to have shifted away from confronting the military directly to an increase in attacks on civilian areas, as we saw only last week when an elderly woman and 10-year-old girl blew themselves up at a Muslim prayer gathering in northeastern Nigeria. “We should not be confused by this change, hateful as it is: It does not mean that Boko Haram is succeeding in its aims — it shows that it is losing. “While we work to defeat the terrorists, I ask the people of Nigeria and the world for resolve and fortitude. The campaign we will wage will not be easy; it may not be swift. We should expect stages of success and also moments when it may appear that our advances have been checked. “But no one should have any doubt as to the strength of our collective will or my commitment to rid this nation of terror and bring back peace and normalcy to all affected areas.